COLUMBUS, Georgia -- Reward your canine hunting buddy for a job well done with Realtree Turducken Blend Dog Treats. These treats are made using wholesome and natural ingredients, all derived from farms across North America. It's a mixed bag of all your dog's favorites, including delicious turkey links, duck feet and chicken meatballs. Your pup will never get bored with this blend! 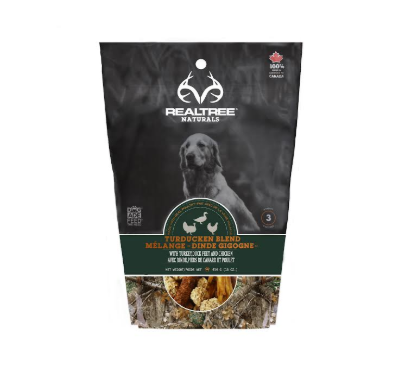 Realtree Naturals Dog Treats are the culmination of 30 years of innovation, research and success. Old-school processes like slow-roasting and wood-smoking are merged with the latest in food-safety standards to make all-natural limited-ingredient chews and treats with wellness benefits.